A popular “trophy” pub south west of the Melbourne CBD has been put on the market. 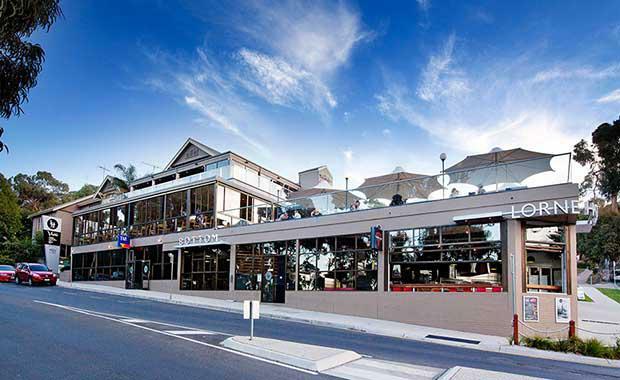 The Lorne Hotel is situated on a prominent corner overlooking Louttit Bay on the Great Ocean Road in the surf coast township of Lorne, approximately 140-kilometres south west of the Melbourne CBD. The hotel presents as a modern entertainment complex incorporating a sports bar, 300-seat beer garden, huge bistro dining room for 230 patrons, bottle shop, pizza bar, and top floor function facility, with 10 gaming machines and 13 accommodation rooms. CBRE Hotels’ Scott Callow & Joseph Du Rieu, in conjunction with Stephen Cropley and George Iliopulos of Cropley Commercial, have been appointed to sell the freehold and business interest of the hotel by Public Expressions of Interest. The hotel is currently owned and operated by a private hotelier with significant experience in the hospitality industry. Lorne is a popular destination for holiday makers from Melbourne, and with international tourists visiting the Great Ocean Road attracted by the region’s many natural wonders. Lorne benefits from a swelling population during the summer holiday period, attracting more than 15,000 visitors up from the permanent residential population of approximately 1,500. The Lorne Hotel is well known as the finish line in the National ‘Pier to Pub’ race, the largest open water event in the world, which attracts 5,000 competitors each January. “Opportunities to acquire such a prestigious hotel as a freehold going concern are rarely offered to the market,” Mr Callow said. “We expect the asset to appeal to a variety of high net worth individuals, investors and hotel owner operators keen to acquire a prestigious hotel in one of Victoria’s premiere holiday destinations,” Mr Cropley added.